Improve and optimize efficiency of HVAC and related energy systems from an exergy perspective. From fundamentals to advanced applications, Exergy Analysis of Heating, Air Conditioning, and Refrigeration provides readers with a clear and concise description of exergy analysis and its many uses. Focusing on the application of exergy methods to the primary technologies for heating, refrigerating, and air conditioning, Ibrahim Dincer and Marc A. Rosen demonstrate exactly how exergy can help improve and optimize efficiency, environmental performance, and cost-effectiveness. The book also discusses the analysis tools available, and includes many comprehensive case studies on current and emerging systems and technologies for real-world examples. 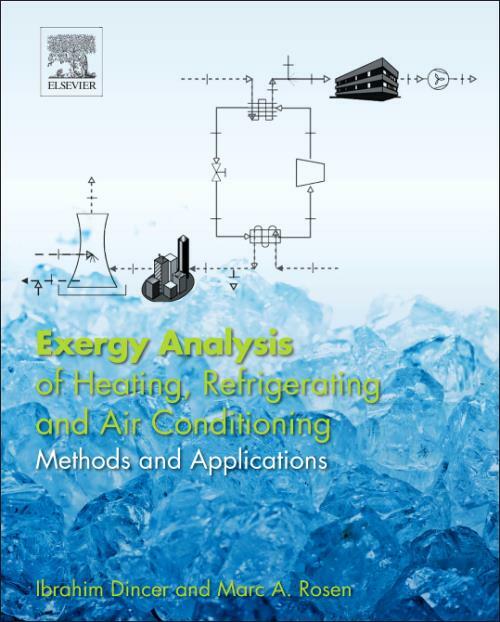 From introducing exergy and thermodynamic fundamentals to presenting the use of exergy methods for heating, refrigeration, and air conditioning systems, this book equips any researcher or practicing engineer with the tools needed to learn and master the application of exergy analysis to these systems. Dr. Ibrahim Dincer is full Professor of Mechanical Engineering in the Faculty of Engineering and Applied Science at the University of Ontario Institute of Technology, Canada. He is also Vice President for Strategy of the International Association for Hydrogen Energy (IAHE) and Vice-President of the World Society of Sustainable Energy Technologies (WSSET). Renowned for his pioneering work on sustainable energy technologies, he has authored and co-authored numerous books and book chapters, more than a thousand refereed journal and conference papers, as well as technical reports. He has chaired national and international conferences, symposia, workshops and technical meetings. He has delivered more than 300 keynote and invited lectures. His main research interests include energy conversion and management, hydrogen and fuel cell systems and renewable energy technologies. Dr. Dincer is an active member of various scientific societies, and serves as Editor-in-Chief and Editorial Board member on several international journals, including Elsevier`s International Journal of Hydrogen Energy and Applied Energy. Dr. Dincer has received research, teaching and service awards, including the Premier's Research Excellence Award in Ontario, Canada, in 2004. More recently, he has been identified as one of the 2014, 2015 and 2016 Most Influential Scientific Minds in Engineering. This honor, presented by Thomson Reuters, is given to researchers who rank in the top 1% for number of citations in their subject field in a given year.